JP and I decided to take another trip to Canada. This time we wanted to check out Winnipeg and then take the Trans-Canada highway to Thunder Bay. I had taken off the Thursday and Friday of that week. By early in the week of our trip, there was a weather forecast for a bad blizzard that was coming around Thursday. I quickly scrambled and was able to take off Wednesday so we could leave a day earlier and hopefully beat out the storm. Well the winter had been rough. There was a ton of snow and it was getting to the point that roofs were starting to collapse under the weight of the snow. My grandma’s roof had a ton of snow on it so my parents wanted to get it shoveled off before the big storm. This put me in a bit of a time crunch since we were leaving for the trip a day early. That Wednesday I went on my lunch break and shoveled as much snow as I could. Then after work I picked up JP and he helped. We started trying to shovel as much snow as possible as fast as possible so we could hit the road as soon as possible. Later my dad came and also assisted us. It was definitely a couple hours of hard work. Once we were finished, we had everything in the car, so we immediately hit the road. 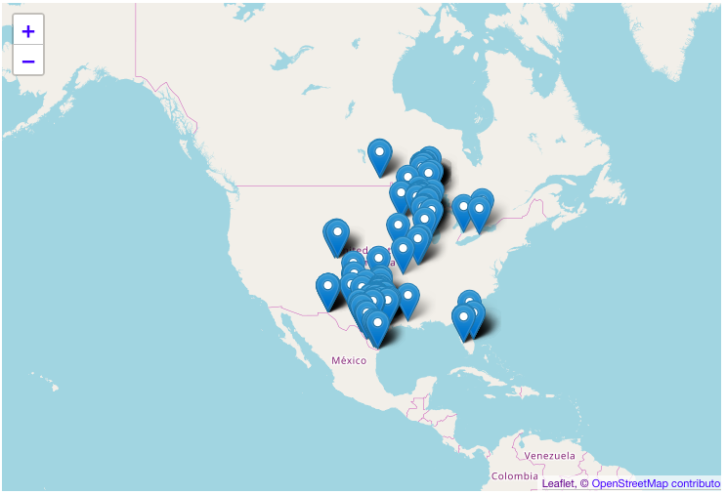 It was definitely an interesting drive since I had worked from 5am to 2pm and then did a ton of snow shoveling. We wanted to hit the Canadian border before getting a room so we could beat out the storm. It was 8 hours of continuous driving. We did get lucky and beat out the storm. As usual, when we got to the border, we were taken into secondary questioning. I remember being asked why we were going to Winnipeg and I said it would be cool to explore and The Guess Who was from there and I was a fan (they also played at our fair that year). I had the Share the Land album in and played Bus Rider a couple more times than JP liked. After a few minutes of questioning, we were on our way. We pulled into Morris, Manitoba pretty early in the morning. We got a room at the Morris Stampede Inn. 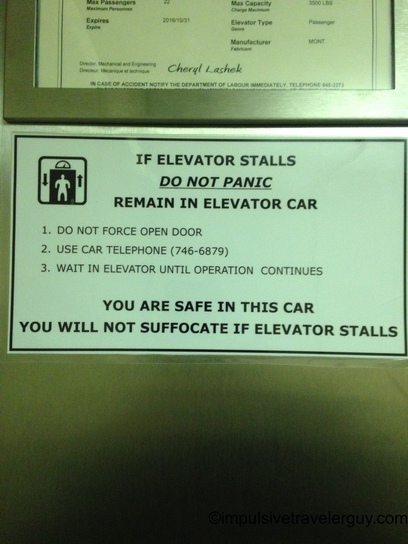 When going up in the elevator, I was happy to find I would not suffocate if the elevator got stuck. We got a few hours of sleep and headed to Winnipeg. The first stop was the mall to get some Wi-Fi and figure out what we wanted to explore. 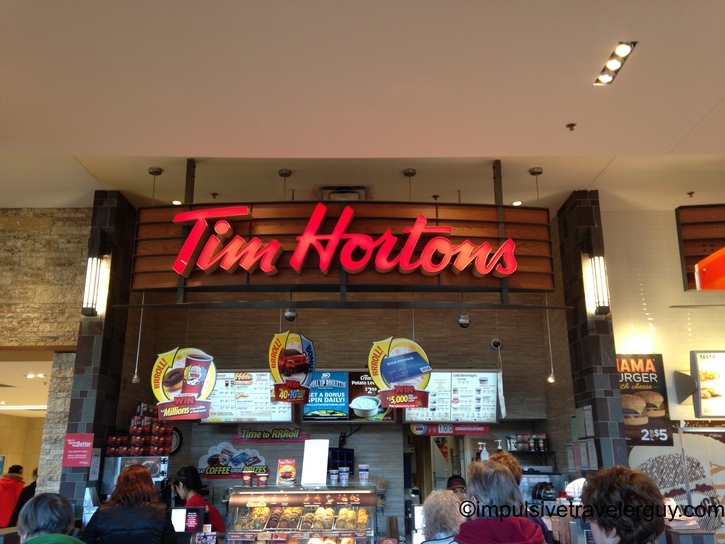 Of course the mall had to have a Canadian staple, Tim Hortons. After exploring the mall a bit, we started driving around a bit. 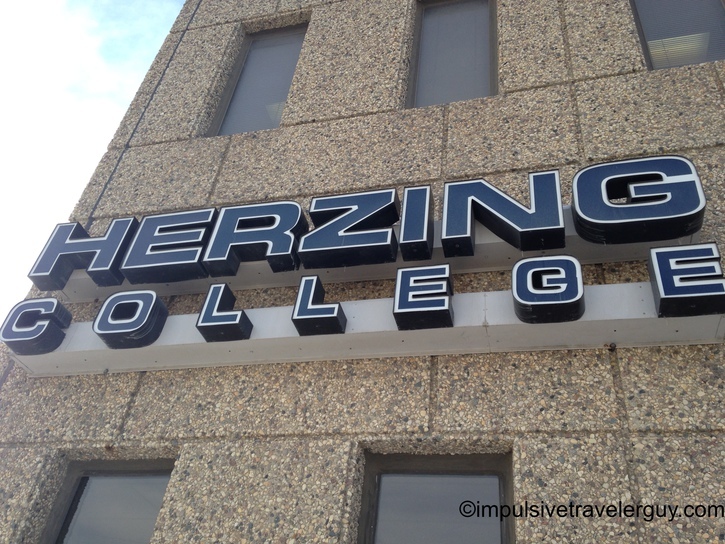 All of a sudden, I came across a campus of Herzing College. I had to stop and get some pictures since that’s where I received my degree (and also currently am working on my MBA through). We decided to go inside and check it out. I mentioned to the receptionist I went to the Madison campus. I was then offered a tour of the building. 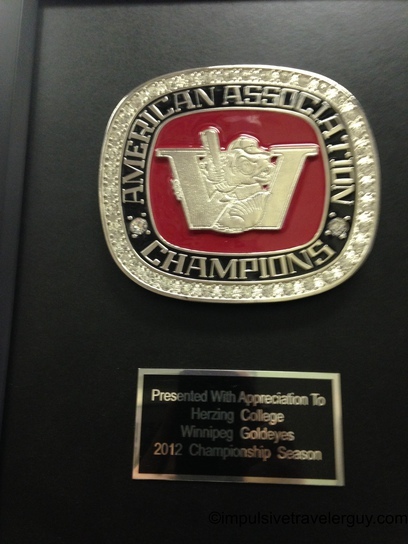 It was cool seeing the differences between the Madison and Winnipeg Campuses. 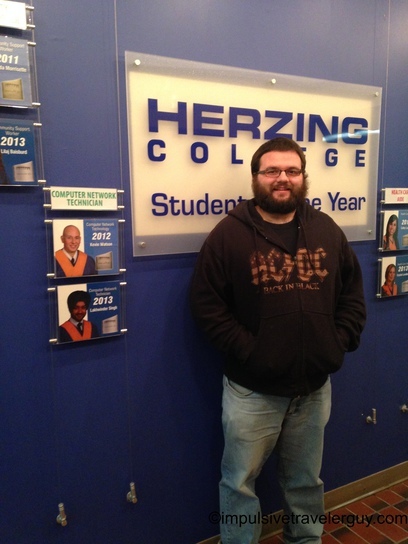 I got my picture by the Herzing Student of the year display. We then drove around a little more and checked out the city. It was starting to get late, so we looked for a place to stay. We wanted to be close to some bars so we could easily walk there and check out Winnipeg’s nightlife. We settled on the Osbourne Village Motor Inn hotel. This hotel was kind of sketchy but wasn’t super expensive. There was a beer store on the other side of the parking lot so I picked up a 12 pack of some local beer called Fort Garry. The beer was very good. When it got a little later, JP and I walked over to where there were a few bars. We first decided on Carlos and Murphy’s. Just like our trip to Thunder Bay, I ended up staying there all night. JP checked out a few other places around the area, but I was having good conversation with the couple people I had met there so I was content staying. We talked about the usual differences in the US and Canada and also about health care, guns, and pretty much everything else under the sun. 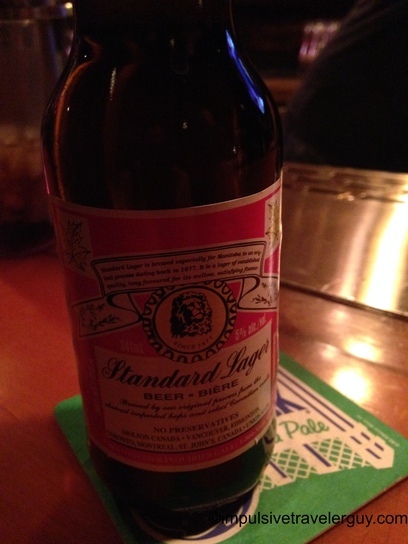 I also drank a local beer called Standard Lager. You’d be fooled thinking the label was Budweiser but the beer had been around just as long as Budweiser so it was interesting that they have the same looking labels. One interesting viewpoint I found that is very American is the view on self-defense. No matter where my American friends are on the political spectrum, they all believe you have a right to self-defense and self-protection. I found that Canadians did not share this sentiment and thought a person should retreat, even in their own homes, and let the cops deal with the situation. The view did seem a bit mixed as one of the guys I was talking to, who was ex-Canadian military and an ex-cop, turned database administrator did agree more on having a right to self-defense. The other guy, who was a biologist from England that had lived in Canada over 25 years did not agree so much and thought the cops should handle the situation. It was definitely interesting hearing these viewpoints, as in America, self-defense is viewed as a right by everyone I know. At around bar close, I walked back to the hotel. JP had already turned in for the night. We woke up the next morning and then went to the mall to get something to eat from the food court. The weather forecast did not look good for our drive on the Trans-Canada highway. We ate something and then stopped by HMV to pick up some different music as JP was sick of listening to Bus Rider. I bought an ABBA CD and JP bought a Nickleback CD. I remember popping the ABBA CD in and pulling out of the parking lot listening to Waterloo. We then hit the Trans-Canada highway. It was very windy and the snow was drifting bad. Overall the roads were clear so we made decent time. As it got darker, it started to snow and the roads became really bad. It got to the point where the only way I could tell where the road was by looking at the snowbanks from the previously plowed snow. It then started snowing harder and the snow was accumulating so fast that I was almost pushing it with my Focus. I made the judgement call to call it a night before we ended up in the ditch. We ended up in the town of Ignace, Ontario at a hotel called the Northwoods Motor Inn. 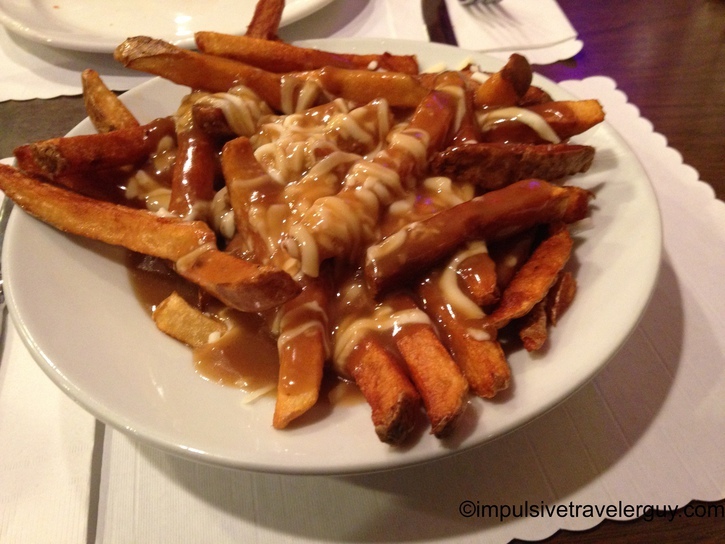 They had a restaurant so I decided to get the Canadian staple of poutine (French fries with gravy and cheese curds). After all the driving in the bad conditions, I was definitely tired. JP had timed me and I literally fell asleep in 2 minutes. The next day, everything was cleared out and it was much easier to drive. I saw I made a good judgement call as there were at least 3 semis in the ditch from the night before. We then made it to Thunder Bay and decided we’d just head back to Marshfield. It was definitely a cool trip and I did get my driving skills tested with the Canadian blizzard I had to drive through.